Theresiamma Joseph Panicker was born on June 13, 1929 and is the seventh child of Philipose Muthalally (Adoor Nellimootil Chittundayil) and Thangamma (Pooyappalli Pariyarathu) families. In 1944, she married Davis of Pazahanji, a village located in north Kerala about 50 miles south of Kozhikkode, of the Tholethu family. The Tholethu family were, from all accounts, extremely powerful and wealthy and especially known for their philanthropy. Davis and Theresiamma had two children, Meenu who was born on August 15, 1947 and Sajive, born on January 13, 1954. Davis ran into bad times with the family business of textiles and retail commodities. This had an adverse affect on his health and he died not long after the downfall of the business. Theresiamma, after her husband�s death went back to Adoor to live with her parents. She raised her two children there. It was while living in her family home of Chittundayil that she remarried AG Joseph Panicker , in 1967. 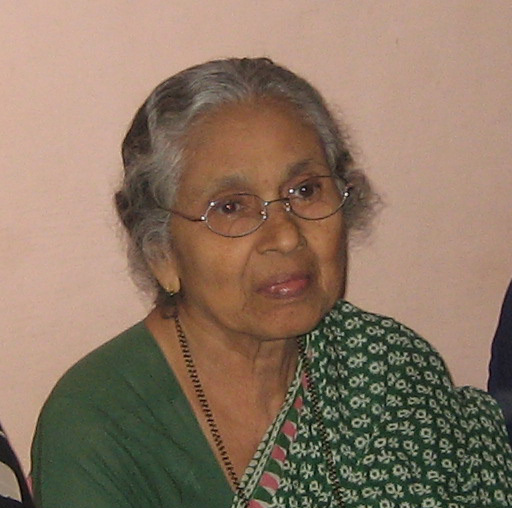 Of the two children from her first marriage, Meenu married in 1967 and lives in Mulanthuruthy. Sajive died an untimely death in 1995. Theresiamma after her second marriage, initially lived at Adangapurathu, and had two daughters, Ashwathi and Renu, while living there. In 1974, Joseph Panicker moved his second family to Kalloopara where he had built a house and had some property. Ever since then she has kept herself occupied by managing the Kallopara property. Theresiamma celebrated her 80th birthday on June 13 of this year.